Our solution helps the scheme guard against fluctuations in Interest rates and Inflation whilst giving a set of growth assets the maximum opportunity to recover deficits and pay pensions. We combine a ‘Pooled’ Liability Driven Investment Strategy with a Segregated Mandate Growth and Income Strategy. Most schemes have fewer assets than liabilities and cannot afford to purchase a bond portfolio, which would fully match the liabilities. Assets and liabilities are sensitive to different risks and the scheme funding levels are volatile. Schemes are also exposed to asset risk because assets can be volatile and may not deliver the required growth. Schemes are also exposed to liability risk because the cost of paying future pensions varies over time. Restructure the portfolio so that it meets duration, inflation and cash flow requirements. Dynamic Asset Allocation to mange the allocation between LDI funds to ensure that the asset allocation remains efficient and benefits from yield differences between assets. Every pension scheme has the same objective - to pay members’ pensions (or their liabilities). 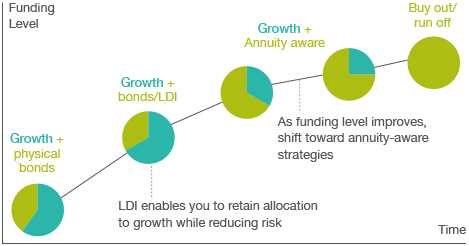 LDI aims to help pension schemes reduce volatility surrounding their funding levels and contribution requirements. Changes in both interest rates and inflation represent two of the largest risks to scheme funding levels. A pension scheme’s liabilities can be thought of as a series of expected future payments cash flows. Interest rates: If interest rates increase/decrease, this will not have an impact on the amount of expected cash flows, but will decrease/increase their current value. If a scheme invests in assets that have similar interest rate and inflation characteristics (or sensitivities), then changes in the current value of the liabilities due to movement in interest rates/inflation will be offset by changes in the value of the assets, reducing the volatility of the scheme’s funding level. The relevant interest rates and inflation are different depending on the timing of the cash flow – e.g. the 20 year interest rate is different to the 5 year interest rate – and fluctuate in value differently. Consequently, it is often desirable to hedge characteristics (or sensitivities) for a range of different time periods to better match the liabilities. 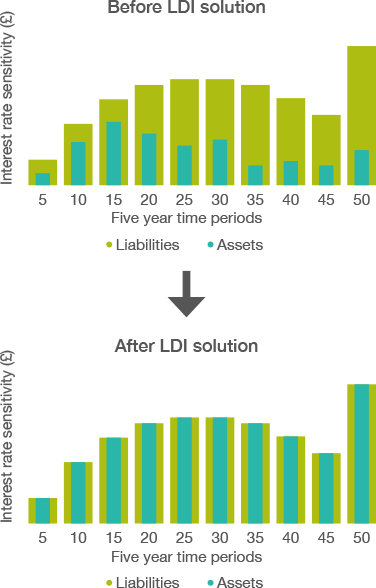 A pension scheme would invest in assets that match their liability’s sensitivity in each five year time period, as set out in the second chart below. Formerly, this type of investment strategy was only available and cost effective for large schemes. Over the last few years ‘pooled LDI funds’ have been developed by a few providers, which allow smaller scheme entry. 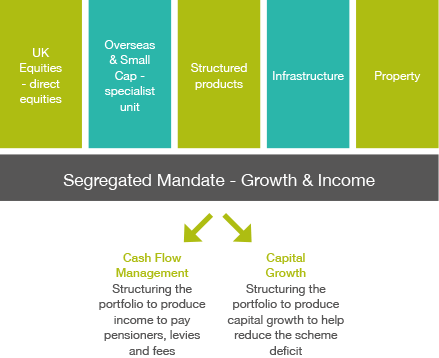 Utilising the services of a Discretionary Fund Manager (DFM) we can develop a segregated mandate for Growth and Income purposes. The DFM allows a much more flexible approach than selecting ‘pooled’ growth and income funds, which by their nature are ‘off-the-shelf’ solutions. Such solutions are almost impossible to build into the cash flow requirements of the scheme. The DFM has the flexibility to make day-to-day tactical decisions when managing the scheme assets with a view to achieving the overall, long term strategic growth and income aims of the scheme. They have the ability to react relatively quickly to economic and market events and make changes to the portfolio within the ‘risk parameters’ agreed periodically with the trustees. There is also the flexibility to alter the mandate, at any time, with the trustee’s agreement, if it is deemed necessary to increase or reduce risk in order to target a certain level of return. The scheme assets can either be managed in their entirety by the DFM, using a broad range of different assets to create a diversified portfolio or they can work on a segregated mandate, limited to a specific range of assets. The advantage of ‘splitting’ the scheme assets between providers would allow access to different strategies, increased diversification and access to expertise in specific investment areas. UK Equities - direct equities investment will often be appropriate and has the advantage of no underlying fees such as annual management charges: allow the DFM to build bespoke portfolios, avoiding sectors and companies which the DFM does currently favour (unlike trackers and many other pooled funds). The DFM may also look to invest in companies with a good yield (and sustainable dividend policy) in order to enhance returns. Overseas Equities/Small cap - access via unit trust / investment trust as direct investment is more difficult and would increase risk.